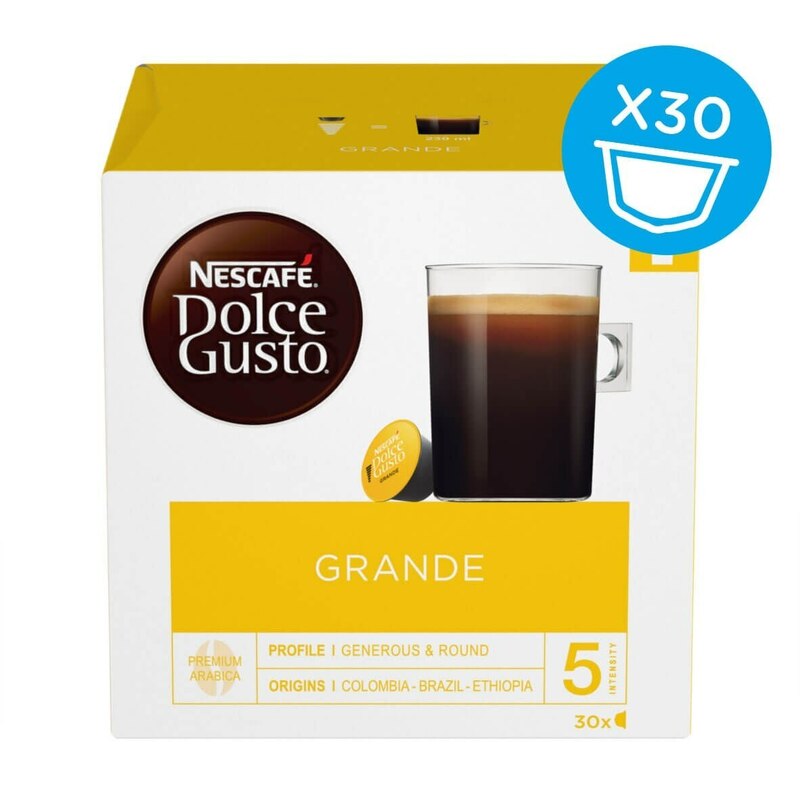 If you find yourself returning to the taste of our classic Grande when you fancy a coffee, why not try the Grande magnum pack with thirty pods? Filled with the smooth, satisfying taste of medium-roast 100% Arabica coffee beans, each Grande coffee pod is another everyday coffee that’s nevertheless far from ordinary. Our Grande is great served with or without milk, which makes it a flexible choice for when you have visitors too. These coffee pods are packed with a great coffee taste that’s confident yet subtle, easy on the taste buds and great from the first cup of the day to the last. With thirty tasty pods to each magnum pack, there’s no need to save those coffee moments for special occasions. Whether you’re entertaining guests or enjoying some alone-time, the classic taste of this straight-up coffee is a must for coffee lovers who value a blend with top-quality Arabica beans. However you like your coffee, having some tasty Grande coffee pods in your cupboard means you won’t run out of options anytime soon. After all, every collection of coffee capsules should contain a classic! Grande lovers might also enjoy our delicious Lungo pods, the espresso shot made into a longer, subtler drink just perfect for sipping. good taste just add a little milk.. I thought these would be good and so bought a big pack but it takes a good 5 mins to come out and then it's not hot so I had to microwave it to get it hot enough to drink. To be honest decent instant coffee would have been as good. Wasted a couple of these pods trying it again to see if it was just a one off but all went the same way. Buy a small pack to see what happens before you risk more money. This is a good value coffee which I enjoy in the morning. Strong enough to give me the kick I need in the morning! Bookers/Makro sell 3 packs of 16 for £10. You can mix and match too. Over the years my coffee (read caffeine) needs have increased. I therefore first bought Grande Intenso which pack a punch even in a long (big) cup/mug. These pods are less intense but still tasty in a big mug - and available in a better value Magnum pack. A potential for me to (slightly) reduce my dependency! This coffee is quite strong, so I always have it with milk. Makes a really big cup, which is a bonus, as it lasts me while I wake up each morning. The Grande is a lovely tasting, rich coffee, best with a dash of single cream, any time of day. The only comment is about the price - one of the big UK supermarkets sells boxes of 16 pods for £3.99, but two packs for £7, which makes it cheaper than here on line, for a big box of only 30 pods. Do you do price matching?